X-Small - $34.99 Only 2 left! Small - $34.99 Only 8 left! Medium - $34.99 Only 8 left! Large - $54.99 Only 4 left! We all want to be the hero of our favorite thrilling space-opera saga, but we’re pretty sure they stopped taking applicants for that job a long time ago. Luckily, anyone can still do the next best thing: dress up just like the brave men and women in a galaxy far, far away whose can-do spirit and faith in the Force brought down an empire that seemed impossible to defeat. And that’s a pretty solid alternative! But here in the Milky Way, we tend to be pretty light on functional repulsorlifts and pretty heavy on compulsory social functions. And while the bright orange of an ace X-Wing pilot’s standard-issue flight suit can liven things up with a colorful splash, it’s a better fit for a sortie in space than a soirée in honor of the Rebellion (or any other special occasion). 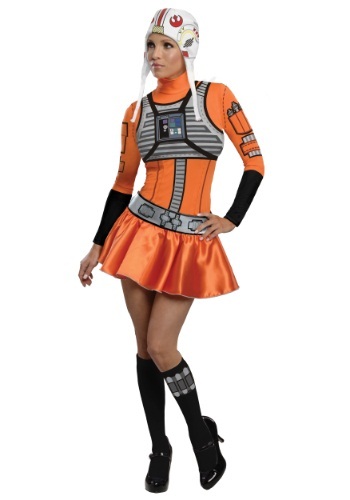 This X-Wing Fighter Dress Costume, on the other hand, seems perfect for a post-trench run medal ceremony or a spontaneous Ewok dance party! Along with the orange minidress jumpsuit, this complete look includes the black stockings and white knit hat pictured here. Add a pair of boots or heels and you’ll feel like you could take on the whole Empire yourself! If you really want to keep up with the top guns of the Rebel fleet, consider adding a blaster pistol or upgrading to an authentic collectible helmet. But even if you stick to the essentials, let this outfit be a reminder that the Force will be with you, always!